Mangrove forests where the cuckoos are reportedly found. Ed VanBuren, Mark Spina and I are spending ten days in southwest Florida. We headed down with friend Theresa Panny, who we dropped off in Brandon to spend spring break with her family. The weather is great. Mid eighties, breezy and sunny. The birding has been just so so the first full day. On the way down rt 75 yesterday, we had a total of five SWALLOW-TAILED KITES. This morning, I birded the lighthouse on Sanibel Island. There were no real migrants this am, but I did get to see a Northern Gannet off the point. I ran into Donald and Lillian Stokes, who’m I have met several times before. They were kind enough to say they remembered me. It was great to see them again, they are always so friendly and informative. After we birded the area of the Lighthouse without much success, They recommended that I go to Vince McGrath’s to try for the Lazuli Bunting which is a great bird for Florida. I followed their directions and was able to see the bird easily. Thank’s Don and Lillian! Also thanks to Vince McGrath for his hospitality. 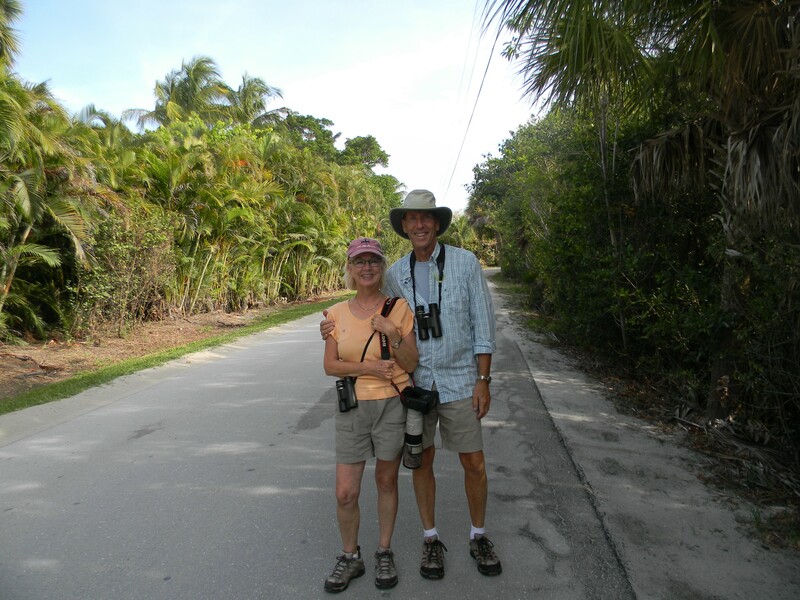 This morning, 4/6, Mark Spina and I birded Corkscrew Swamp Sanctuary. I could not believe the lack of birds for this time of year. I had only three warbler species. Northern Parula (30), Black and White Warbler (2), and one Northern Waterthrush. We had only commonly expected species and no migrants other than the warblers. A Barred Owl chick sitting in full view high up in a tree was a nice find. Carolina Wrens were seen and heard in numbers I have never experienced before. At least 30 of these birds, many in family groups with young were seen. 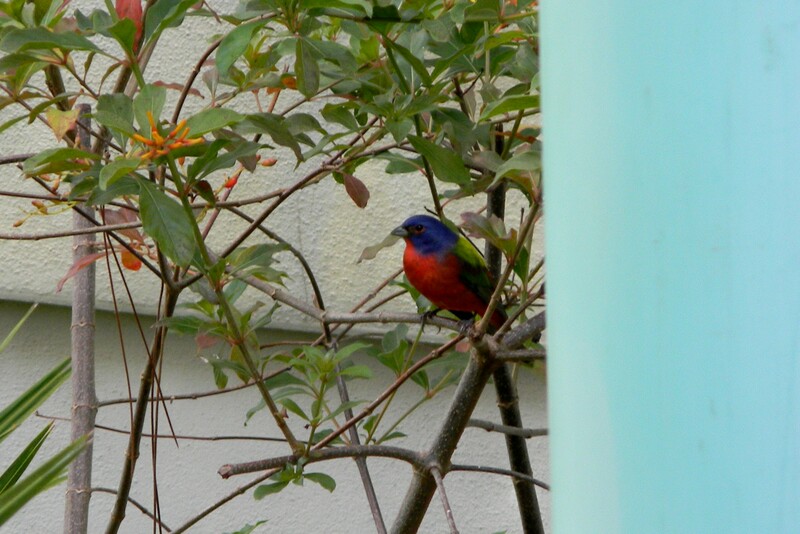 A male Painted Bunting was hanging out at the feeders at the visitors center. Due to low water levels, many waders were hanging out at lettuce lake where they and several alligators were feasting on fish trapped in shrinking pools. Today,4/7, I birded Eagle Lakes Park and Marco Island, both near Naples Florida. At Eagle Lakes Park I was surprised at the lack of passerines. Black-necked Stilts were easily seen as were both Ibis’ and all the herons. I heard a Sora calling, but couldn’t spot it. Palm Warbler, Brown Headed Cowbird and Prairie Warbler were the only new passerines. Least Sandpiper and both Yellowlegs were seen. I was surprised at the number of wintering birds. There were still many American Coot and Blue-winged Teal. I thought these would have been gone by now. More great looks at a Swallow-tailed Kite were nice, but it got away before I could get a photo. From Eagle Lakes, I went to Marco Island. I searched the mangroves on the road over and Capri Isle Road for Mangrove Cuckoo and Black-whiskered Vireo, but found neither. Prairie Warblers were abundant here. On Marco, I found my first Magnificent Frigatebird of the trip and a Burrowing Owl. On 4/8, I birded Sanibel Island. I started before dawn at the lighthouse, hoping for Chuck-wills-widow. I found none. I waited for sunup to try for some of the good birds reported over the last two days by the Stokes. The birds had moved on. The best bird of the morning was an Eastern Screech-owl calling from a palm thicket. I think he was in one of two holes in a broken palm, but I couldn’t see him. He sang for about 45 minutes, but had quieted by 7:15 am. From there, I headed to the Baily Tract to try for the Gray Kingbird reported over the weekend. Again the bird was gone. I did have a small group of warblers here including Prairie, Parula and Common Yellowthroat. There were many Black-necked Stilts. I then headed for Bunche Beach to try for shorebirds. It was quite birdy and I had a number of species there. A Reddish Egret was nice as well as many Marbled Godwits. At the beach again in the afternoon, water is 80 degrees! On 4/9, I headed out early to Hugh Taylor Birch State Park in Ft. Lauderdale. Yesterday a Western Spindalis (female) had been found at the Park. This would have been an ABA bird for me, but though many birders searched throughout the morning, the bird was never relocated. It was a fairly productive trip, I saw a Red-eyed Vireo, which was a new state bird for me as well as a Black-throated Blue Warbler and some Nanday Conures. Other birds I had seen already. I met Rangel Diaz there. A very nice young man who happens to have a trip planned to New York in June. I gave him some pointers as to where to find the birds he was seeking. This mornng, 4/10, I birded one of my favorite locations in south Florida. Babcock/Webb WMA. This spot is great for some of South Florida specialties. RED-COCKADED WOODPECKER, BACHMAN’S SPARROW, Brown-headed Nuthatch and the Florida race of Eastern Towhee (White-eyed Towhee) can all be seen. This morning I had all but the nuthatches, which were missing in action. (last trip, November, I had many) I hadn’t seen Bachman’s Sparrow in four years and was hoping to see some. I wasn’t disappointed, I had five singing males. Other birds seen included many Common Ground Doves, Loggerhead Shrike, Boat-tailed Grackle, Northern Bobwhite, Brown Thrasher, Eastern Bluebird, Palm and Pine Warbler to name a few. I also found a butterfly which I did not recognize. I got photos and it turned out to be a lifer, GEORGIA SATYR, really nice butterfly. Beach time again in the afternoon. On 4/11, I basically took the day off. I walked the beach in the morning and swam several times in the afternoon. You are never far from birds here, and many were seen on the beach. Willet, White Ibis, Ruddy Turnstones, Sanderlings, Brown Pelican, Common Grackle, Osprey, Red-breasted Merganser, Snowy Egret, Northern Cardinal, Common Ground Dove, Mourning Dove, Eurasian Collared Dove, Royal Tern etc. were all seen. The best sighting of the day however was a WEST INDIAN MANATEE which passed the condo about 50 feet off the beach this morning. It was the first we had seen this year (though heard they had been around), making it a clean sweep of all our spring trips through the years. We only rarely get them in the fall. Bottled Nosed Dolphins are present every morning, and a pod passed just prior to the Manatee showing up. It was about a ten foot Manatee, not the biggest we’ve seen here. Today 4/12, we kayaked through the mangroves at Bunche Beach. The trip took two and a half hours, including the part along the open beach. I was searching unsuccessfully once again for Mangrove Cuckoo. I did find many Prairie Warblers (resident race), Northern Cardinals and Great Crested Flycatchers. I heard many vireos giving scold calls, but could not see them. The only vireo I heard by song was a White-eyed Vireo. Along the beach I had all the expected shorebirds, including my first Wilson’s Plover of the trip. The other new trip bird was a pair of courting LEAST TERNS. A nice morning. This morning, our last day 4/13, I tried to get some pics of Swallow-tailed Kites. The birds have been very active, but getting a pic has been hard. This morning, little had changed. They fly very fast and catching up to them is no cinch. I’ve attached one identifiable shot. In Conclusion: We had a great trip to Florida. The weather was perfect. Eighty degrees and sunny with no humidity and an ocean breeze every day. The birding was somewhat lackluster, though I managed to add four birds to my state list. Lazuli Bunting, Red-eyed Vireo, Solitary Sandpiper and . Bringing my Florida state list to 263, not including a dozen exotics which are’nt countable. I had a total of 116 species on this trip which was an all time low count for a single trip. I was just a little to early for migration and the summer breeders had not really arrived yet. Of a trip target list of 13, I only saw Swallow-tailed Kite, Bachman’s Sparrow and Least Tern. It would have been more productive had I waited until later in the month.